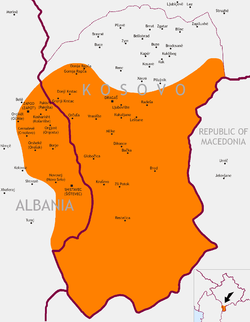 Gora (Cyrillic: Гора) is a geographical region in southern Kosovo, northeastern Albania, and northwestern North Macedonia inhabited by Albanians, Macedonians, Bosniaks, Bulgarians, Gorani, Serbs and Turks. Between 1992 and 1999, the part of Gora in Kosovo was a municipality, and its population was 17,574 people according to the 1991 census. Today, the region is part of the municipality of Dragaš in Kosovo. The Albanian part of Gora is included in the Shishtavec and Zapod municipalities, while the Macedonian portion is in the northeastern part of Bogovinje Municipality. In the west of Gora is the region of Lumë, which extends in both Kosovo and Albania. The region of Gora within Albania is made up of 10 traditionally Gorani inhabited villages: Zapod, Pakisht, Orçikël, Kosharisht, Cernalevë, Orgjost, Orshekë, Borje, Novosej and Shishtavec. According to the disputed 2011 census figures, just over two-thirds of the population in Shishtavec Municipality identified as Albanian, while 7.7% identified as Macedonian. In Zapod Municipality, 79% identified as Albanian and 11.7% identified as Macedonian. The region of Gora within Kosovo is made up of 19 traditionally Gorani inhabited villages: Baćka, Brod, Vranište, Globočica, Gornja Rapča, Gornji Krstac, Dikance, Donja Rapča, Donji Krstac, Dragaš, Zli Potok, Kruševo, Kukuljane, Lještane, Ljubošte, Mlike, Orčuša, Radeša and Restelica. Kosovo's Gorani people have stated that they want the former Gora municipality with a Gorani majority that was merged with the Albanian-majority Opolje to form the Dragaš municipality which has an Albanian majority) to join the Community of Serb municipalities. On 3 November 2013, 70% voted in favour of establishing the Gora municipality as part of the Community of Serb municipalities, according to Gorani political leader Safet Kuši. Within the Republic of North Macedonia, there are two Gorani inhabited villages: Jelovjane and Urvič located in the Polog region that neighbours the Gora region. During the Macedonian census of 2001, the population of Jelovjane self declared as Turks (90%) while Urvič self declared as Turks (85%) and Albanians (15%). ^ "Albania's Gora Minority Takes Bulgarian Route to EU :: Balkan Insight". www.balkaninsight.com. Retrieved 15 September 2017. ^ "Gorani" (PDF). www.joshuaproject.net. Retrieved 15 June 2018. ^ Steinke, Klaus; Ylli, Xhelal (2010). Die slavischen Minderheiten in Albanien (SMA). 3. Gora. Munich: Verlag Otto Sagner. p. 11. ISBN 978-3-86688-112-9. "In den 17 Dörfern des Kosovo wird Našinski/Goranče gesprochen, und sie gehören zu einer Gemeinde mit dem Verwaltungszentrum in Dragaš. Die 19 Dörfer in Albanien sind hingegen auf drei Gemeinden des Bezirks Kukës aufgeteilt, und zwar auf Shishtavec, Zapod und Topojan. Slavophone findet man freilich nur in den ersten beiden Gemeinden. Zur Gemeinde Shishtavec gehören sieben Dörfer und in den folgenden vier wird Našinski/Goranče gesprochen: Shishtavec (Šištaec/Šišteec), Borja (Borje), Cërnaleva (Cărnolevo/Cărneleve) und Oreshka (Orešek). Zur Gemeinde Zapod gehören ebenfalls sieben Dörfer, und in den folgenden fünf wird Našinski/Goranče gesprochen: Orgjost (Orgosta), Kosharisht (Košarišta), Pakisht (Pakiša/Pakišča) Zapod (Zapod) und Orçikla (Orčikl’e/Očikl’e)’. In der Gemeinde Topojan gibt es inzwischen keine slavophone Bevölkerung mehr. Die Einwohner selbst bezeichnen sich gewöhnlich als Goranen ‘Einwohner von Gora oder Našinci Unsrige, und ihre Sprache wird von ihnen als Našinski und von den Albanern als Gorançe bezeichnet." ^ "Ethnic composition of Albania 2011". Retrieved 7 August 2014. ^ Vlašković, Zoran (2013-02-07). "Goranci u obruču brane Srbiju" (in Serbian). Press Online. Retrieved 5 May 2015. ^ "municipal profile of Dragaš" (PDF). , June 2006. Retrieved on 21 February 2008. ^ "Goranci: Ne želimo u Dragaš već u Zajednicu srpskih opština" (in Serbian). Blic. 2013-11-08. ^ Гласник Српског географског друштва (1947). Volumes 27-30. Srpsko geografsko društvo. p. 107. "Данашњи становници Урвича и Јеловјана на супротној, полошкој страни Шар-Планине, пореклом су Горани." ^ Vidoeski, Božidar (1998). Dijalektite na makedonskiot jazik. Vol. 1. Makedonska akademija na naukite i umetnostite. ISBN 9789989649509. p. 309. "Во западна Македонија исламизирано македонско население живее во неколку географски региони на македонско-албанската пограничје:... во Полог (Јеловјане, Урвич). "; p. 315. "Автентичниот горански говор добро го чуваат и жителите во муслиманските оази Урвич и Јеловјане во Тетовско иако тие подолго време живеат во друго дијалектно окружување." ^ Macedonian census, language and religion, pp. 110-111. Wikimedia Commons has media related to Gora (region).